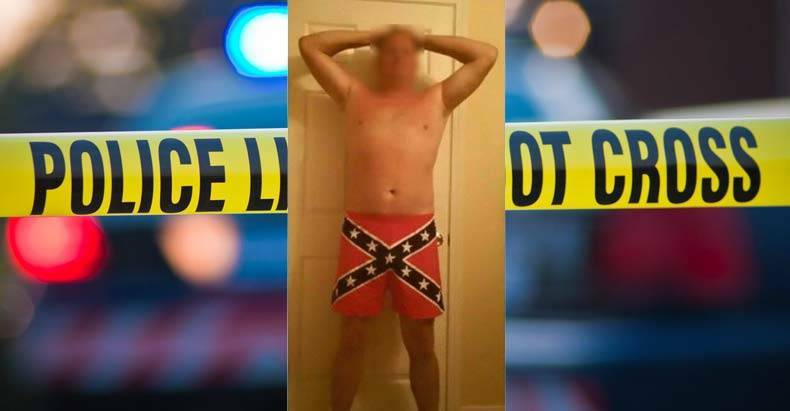 North Charleston, SC — A North Charleston cop was fired Thursday after he posted a photo to his Facebook page showing him wearing nothing but Confederate flag underwear. The photo quickly began to spread across the internet this week in the wake of the recent controversy exploding over this flag. This week, Walmart, Amazon, eBay and Sears all announced bans on the sale of Confederate flag merchandise, amid an intensifying national debate. The actions by this officer were most assuredly in poor taste, but his immediate firing speaks to the ridiculous nature of the politically correct police state. We’ve seen police officers being caught on video beating innocent people, beating up people with down syndrome, and even kill children, and keep their jobs! This man took a picture in boxer shorts that have the same symbol as the flag flown over his state capital and he was immediately fired. What does this say about all the innocent lives taken, people beaten, and rights violated by cops who remain on the job? Officer Joseph Weekley shot and killed a 7-year-old girl as she slept on the couch and he remains a police officer! Officer David Catching, was arrested twice in a four-month period for driving under the influence and beating his mother-in-law, he was not fired. School resource officer, Robert Lellock, raped 22 boys throughout his career, he was never fired. Cops across the country are laying waste to the rights of individuals, they are indiscriminately killing people, depriving them of their freedom, and this guy gets fired for his choice of underwear. If there is one thing that can actually get you in trouble as a cop, it’s embarrassing your department, but killing people, on camera, is just fine and dandy. It’s truly a sad day for America.